If, like so many of us, you found yourself enjoying those Christmas treats a little too much and too often then you’ve probably made the annual weight loss pledge. In fact, you’ve probably begun your new weight loss diet over the last few days. It’s why gymns record their highest subscription rates for new members in January and why book stores make Mind, Body, Spirit titles, with a heavy emphasis on weight loss, their central promotion at this time of year. Alongside quitting smoking, New Year dieting is a bankable pattern; as certain as novelty sweaters, board games, reruns of TV Specials from Christmas past and the misjudged gifts people give you before telling you why you like them! The annual battle of the bulge has a slightly different twist this year. Thanks to some interesting research by Marks & Spencers (aren’t they in part responsible for our widening winter waistlines? ), we can now look at weight loss strategies across the sexes and apparently the men are doing it just that bit better! The role reversal emerged following the study carried out among 1,850 adults. It showed men lose weight faster and find it easier to keep off. Typically, some of these men even had the gall to declare that they actually found the weight loss process ‘easy’. The nerve! Reading all the findings from this piece of research seems too much like hard work, so thankfully M&S prepared a neat Infographic. We’ve sliced it up here (mmm, slices…) into digestible chunks (sorry, we just can’t help ourselves…these puns write themselves). So scroll down for a graphical summary of the findings. Apparently 30% of the female respondents stated that they wavered on their diets as willpower ebbed. 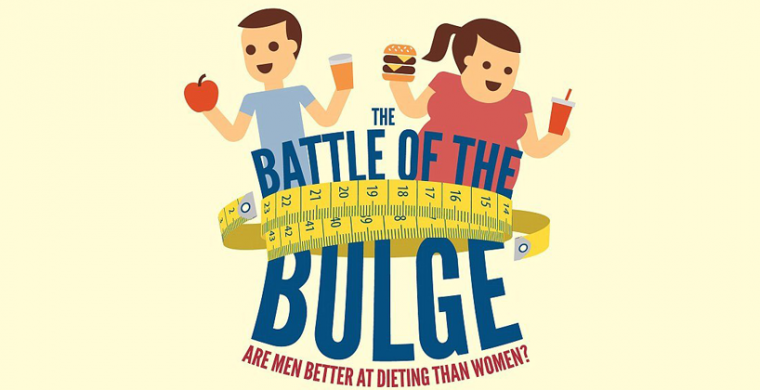 Interestingly, this part of the infographic follows that revelation up with a fairly smug and self-satisfied depiction of cartoon men showing us how they achieve their weight loss. The male respondents kept following their goals, using metrics along the way. Men were more likely to get on the scales at least once per week and adjust their strategy accordingly. For them, the battle of the bulge is tactical warfare! Women, however, trumped the men when it came to keeping their healthy five-a-day upfront and centre in their regimes. Should we be shocked? Only 13% of respondents – across the sexes – were prepared to give up alcohol to lose weight. If all of this adversarial weight loss, pitting men against women, seems a little too much, thankfully there is plenty of evidence that weight loss strategies often work better as a team, than two soloists. The activities you engage in together, the places you dine (and how many courses of the menu you partake in), the moral support you can give each other are just some of the ways weight loss can work better as a duo. Here at Intro Matchmaking, we heartily welcome all-comers and all shapes and sizes as members. We think you’d be pleasantly surprised at how many of our members share the same anxieties about everyday things, including weight loss! There’s so many potential dating matches available to you as an Intro member. Contact Us today and arrange an appointment where we can meet you in person and tell you more!